This week, I’ve stumbled across several examples that make me wonder how product launches are going to work in the future. In the land of radical transparency and social media, leaks and speculations happen all the time. Rumors about Apple and future product launches happen daily, becoming almost a sport unto itself. Proctor and Gamble announced some layoffs this past week as it transfers some of its marketing online, and in the same news release, they discussed new Tide Pods, and their delayed launch. 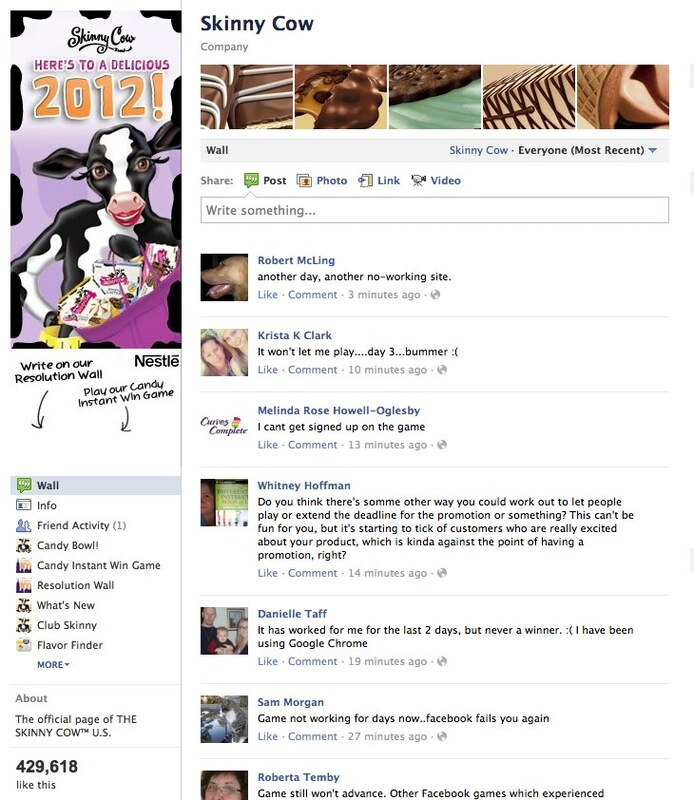 Then I ran into a problem using Nestle’s Skinny Cow app on Facebook, where they are running a promotional contest for their new Skinny Cow Candy. The app has been doing a loop and not letting people enter their information or play the game, and as you can see below, on Day Three-Four, people are getting seriously annoyed. I think these recent examples show how tricky product launches are becoming. Once any information about your product leaks, any variation from the rumor or speculation will get negative press. If you don’t exceed expectations which build with or without your help you are opening up the product and your company for public discussion and getting taken out to the woodshed. Add on what such speculation can do to a stock price as such rumors propagate, and you have a really crazy world with expectations I’m not sure very many people can match. In some ways, the new Kickstarter model has an interesting spin on product launches. Entrepreneurs help get funding from other folks online, and then in turn, offer early models of the product or other bonuses, or nothing but thanks, to investors. But because it is investment in possibilities, and investors are kept in the loop through emails and blogs, it’s more like a joint venture where everyone is rooting for the entrepreneur to succeed. Larger companies have a disadvantage here, but could they possibly change their product launches to be more interactive in earlier stages? Could they invite people in to see the sausage beng made? And would that be better or worse for larger market competitive advantage, if other people know what you’re up to in advance? The online world is a tough place. You open yourself up to lots of criticism, only some of which is fair. 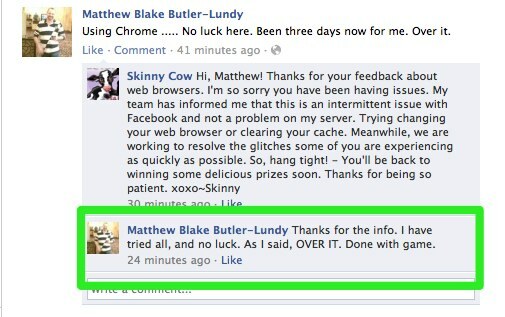 Take the Skinny Cow problem. They are trying something new, for a new product that people love, myself included. The customers want to engage further, but between the evolving nature of Facebook and a demanding audience, you get a lot of unhappy customers that like the product but start to see you as disconnected and not delivering on the promises you made with the contest. This tends to have the opposite effect a promotion is supposed to have, making people more unhappy with you and your product than inclined to engage and spread the word. Product launches are going to get trickier, whether it’s physical products or services, and I think we’re all going to have to watch, learn and evolve in a rapidly changing online environment where small glitches can lead to big headaches for a company. [As an aside, I think this drives home a lesson many of us including my friends over at Marketing Over Coffee, Chris Penn and John Wall say frequently, keep your information and data analysis stuff on your own website rather than a third party site like Facebook. This contest probably could have run just as well on the Skinny Cow Website and avoided issues with having a “like gate” on Facebook, and just had a link driving Facebook folks over to your main website to play- equally effective with none of the headaches. I also went to the effort of looking up the company that was the Agency for Skinny Cow. As someone who plays in this online space, I figured I would give them a heads up that the app was broken and things were starting to get ugly, as I started to feel for whatever poor soul is trying to manage and respond to the fallout on the page itself. I looked at it as being a good internet citizen. That’s a story in and of itself for my next post, but suffice it to say, finding and following up on the digital trail finds that the more cooks who contribute, the less control any one person has to fix things when they go bad.